Brown discoloration of a soybean stem as a result of infection by Phytophthora sojae. Photo Credit: Craig Grau. The Wisconsin Department of Agriculture, Trade, and Consumer Protection (DATCP) pest survey team collected soybean seedlings from 30 fields in eleven counties (Crawford, Dane, Fond Du Lac, Dodge, Grant, Green, LaFayette, Iowa, Jefferson, Racine and Rock Cos.) in Wisconsin in 2016. 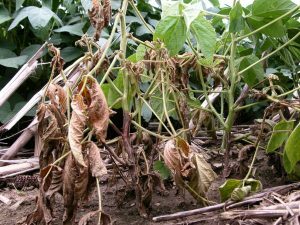 As of June 30, 11 of the 30 fields, or 36.6% have tested positive for Phytophthora sojae. The DATCP team is planning to collect 20 more samples including northern soybean growing areas in the state. Additionally, detection for other Phytophthora species will be performed once all samples are collected.